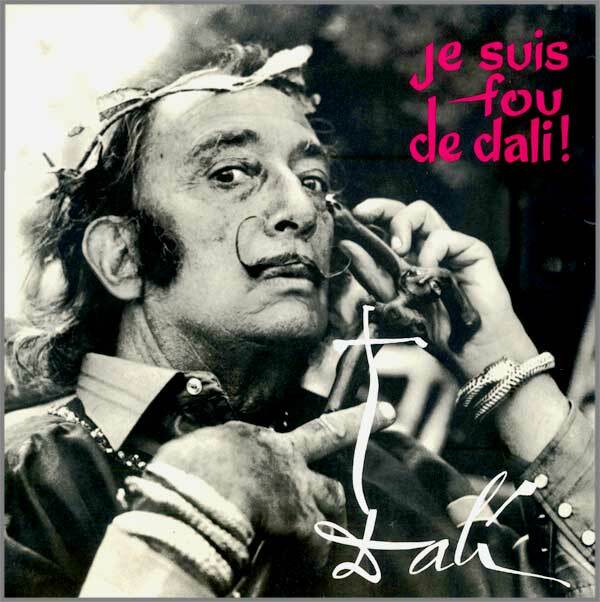 A year after the release of his Cathar audiovisual opera-poem Etre Dieu, with music composed by Igor Wakhevitch, Salvador Dali (actually Dalí) released Je Suis Fou de Dali !, a collection of well-chosen excerpts from an interview in French with 3 journalists: François Deguelt, Jean-Pierre Mottier and Simon Wajntrob. If truth be told, half of it is pure wackiness, the other half self-promotion, and the difference is tenuous at times between surrealism and senility. But if we set aside the many scatological jokes, some excerpts are simply mindblowing, genuine audio equivalents of a Dali Surrealist painting. 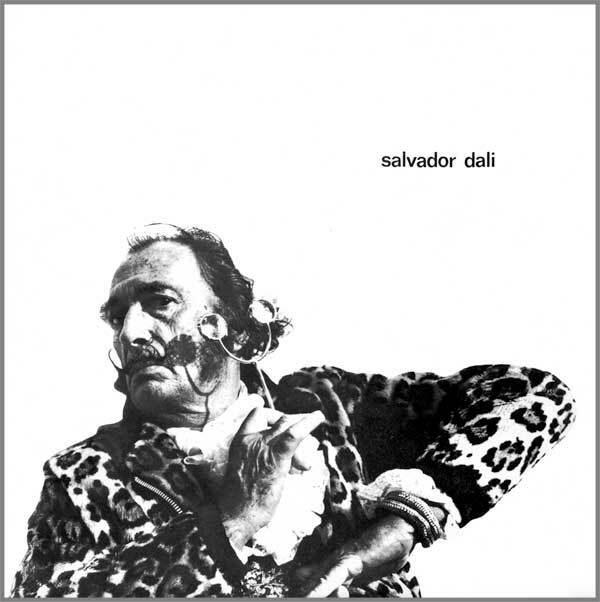 It is also close to some of Dali’s books, like his autobiography ‘La vie secrète de Salvador Dalí’ (1942) or collection of short texts ‘Oui’ (1971). 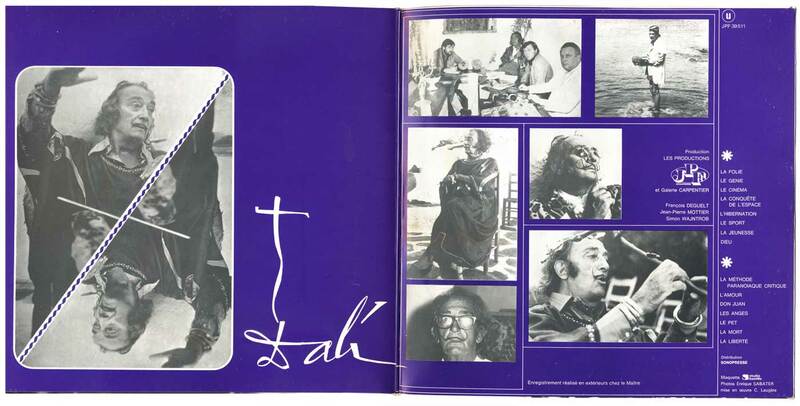 Usual Dali-esque topics recur here and there: sexual impotence of all great artists ; self-proclaimed Catholicism as a means to shock the avantgarde ; scatology, including a warm eulogy of fartiste Joseph Pujol, after which Dali mentions Benjamin Franklin as a dedicated farter (!) ; Dali’s own death and immortality is addressed during an exhilarating excerpt on Walt Disney’s (mythical) cryogenic freezing after his death in 1966, something Dali wishes for himself as well. Quotations abound from great writers and mystics like Cervantes, Montaigne, Stendhal or San Juan de la Cruz. Track #6, Le Sport, focuses on Le Tour de France, the famous annual bicycle race. 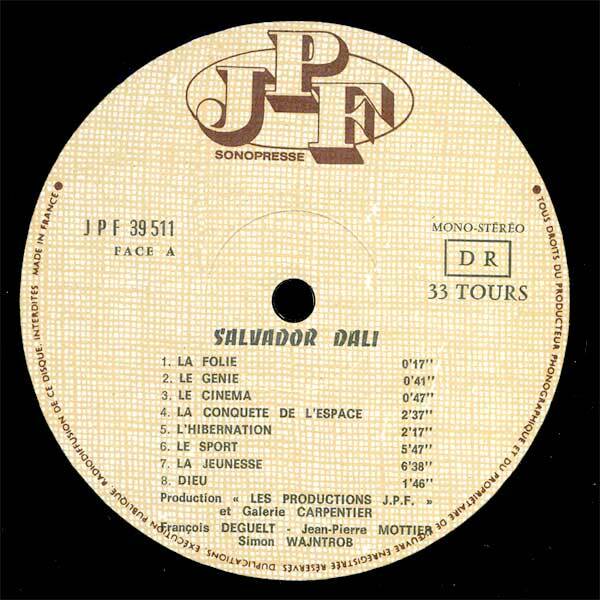 It is for Dali, as for Kraftwerk, an aesthetic epiphany: while he listens in awe to the radio reports from his studio, his mouth wide open and salivating, a little scab forms at the corner of his mouth, which he licks with delight, helping it grow thicker. When he is tired of licking, flies come landing around his mouth and onto the scab. Dali then slowly closes his lips to gently capture a fly between his lips. He’ll only release the insect after delighting in the fly’s efforts to escape.